We left Monday afternoon for our winter vacation. After a boring 9 hours on the plane, we arrived in Copenhagen, Denmark. After a short conflict with the payphone, we met with Michael Heilemann for lunch. Even though we only spent a brief time together, it was a real treat to meet him! I’ve known Michael for several years through his work on WordPress and K2, and more recently with Habari. 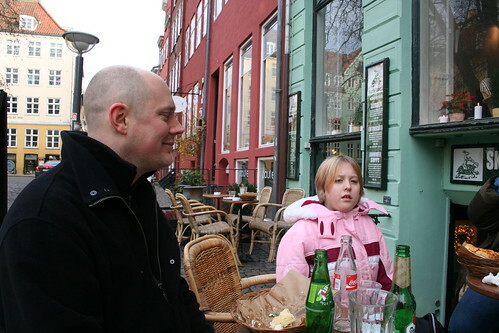 After lunch we took the train to Malmo, Sweden, where we were picked up by Carina’s penpal’s husband, Michael. The reason we’re staying in Malmo is for Carina and her penpal, Helena, to finally meet – they’ve been friends for almost twenty years, and have spoken on the phone a number of times but had never met one another! Helena, Michael, and their daughter Linnea are wonderful people, and we’re so thankful to have such warm hosts. We stayed up (very!) late Tuesday and Wednesday night simply talking. Tuesday we stopped at Linnea’s daycare, where we had a small tour. We’re going back tonight for a children’s Saint Lucia concert, which should be a lot of fun. Wednesday, after a late start, we wandered around Malmo. This proved more taxing than we expected, as the twins didn’t respond well to the lack of structure. Carina and I were glad to be seeing the city, and learning our way around, but the twins wanted something a little more rewarding. I knew that it gets dark early in the afternoon here during winter, but I wasn’t prepared for what an effect it had on me! At 4 PM it was very dark, and my body and brain insisted that it must be past 9. It was a long couple of hours until it was 9, and I had to keep reminding myself that I had no business being tired! Before we left for the trip I had purchased walkie talkies at Radio Shack, so that we could communicate across moderate distances should we split up for any reason. The clerk, upon learning that I was going abroad, tried to sell me a GPS unit – “You don’t want to get lost,” he said. I replied “Yes, I do!” and I meant it: getting lost is how you find those great little treasures that make a trip so rewarding: a cafe hidden away somewhere, or an unexpected event that you never would have found otherwise. 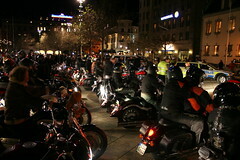 Just such a thing happened to us while looking for a restaurant on Wednesday night: we walked back toward the city center and saw a lot of police officers – a lot more than we had seen through the day. 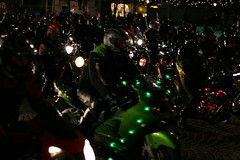 As we approach the square, we saw several hundred motorcycles lined up, with a very large crowd watching them. Perplexed, we asked one of the bystanders what was happening. “Santa Claus” he said, matter-of-factly. 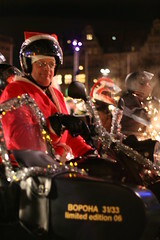 “Malmo tradition, for ten or fifteen years.” Indeed, at the front of the group of motorcycles were several riders dressed like Santa Claus! 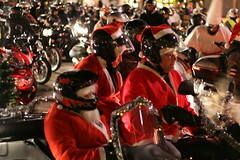 We started taking photographs, and then shortly after the riders set off for a drive through town, led by a dozen Santa Clauses!